If you're plugged into the Dome's 24-hour sports-drip, then you've already got the night's top stories and highlights flowing through your veins. But Alex Reiser and Mark Shepard are back to inject a syringe of pure Dome straight into your heart. 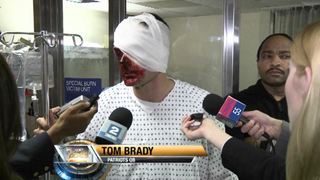 - In a story you saw here first, Patriots head coach Bill Belichick acts out on his jealousy and insecurity with a vicious acid attack on his quarterback Tom Brady. - In California, 13-year-old Corey Lawrence is well on his way to becoming the most prolific masturbator in history with an incredible performance that has grabbed the nation's attention. - And the inspiring story of a brave little Phillies fan battling cancer with the best medicine of all — virulent hatred of Mets third baseman David Wright. In the meantime, browse the OSN website for all the latest sports saturation, and catch up on the baseball-crime procedural the Washington Post calls "the tense, hip crime procedural hardball fans have been waiting for" — "Late Inning Drama," and check out episode summaries on the show's episode guide.